I went to see She & Him at Mercy Lounge last month when my sister and her friend Stacey visited. First of all let me say it took me a while to get into them. My sister ranted and raved about how good they were but I just didn’t get it. After a few listens I had decided they were boring and not my cup of tea. But I decided to give them multiple tries and listened to them in the car, at work and at home almost every day for a few weeks and I slowly began to appreciate the stripped-down old-fashioned sound, the catchy, adorable lyrics and the way listening to them made me feel like I had discovered an old forgotten band from the early 70’s… one that never aged, haha. 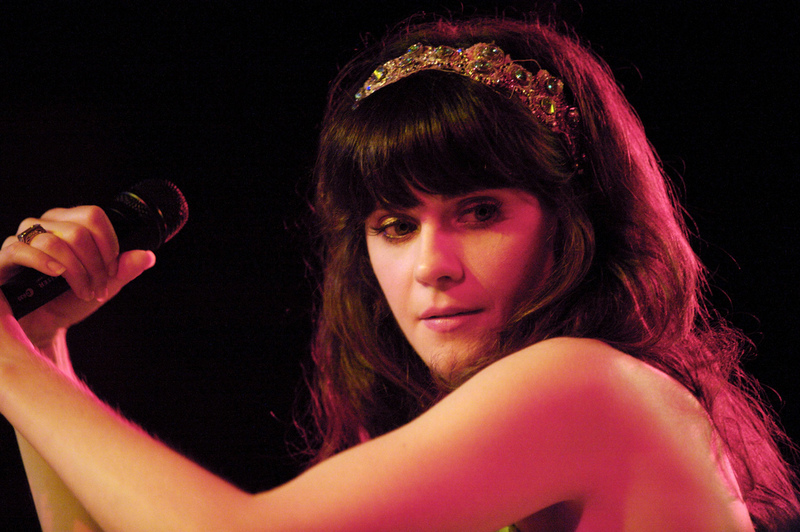 So for those not cool enough to know, She & Him is actually fronted by the actress Zooey Deschanel. One of my favorite comedies is “Elf” where she stars along side Will Ferrell and saves Christmas by singing carols to spread cheer. What’s ironic is in the movie she loves singing but is afraid of singing in public. Well, in person Zooey is probably the most timid and shy performer I have ever seen live. She sounded and looked amazing, even played some piano, tambourine and made horn/trumpet noises with her mouth which was awesome… but overall she pretty much just stood there looking like a deer in headlights. She did start jumping around at the end which was very cute. Oh and if you go to a She & Him show, save yourself a lot of trouble and ridicule and leave your camera at home. At one point in the show Matt Ward (the “Him” part of She & Him) even dedicated a song to “all of you not taking pictures” ouch. Zooey made a couple anti picture announcements as well… seems they are not a fan of the camera. **UPDATE: I don’t know how or why, but somebody put the above photo in Zooey’s official Wikipedia page, as the MAIN photo. It’s been up there for a few years now, and been seen by God knows how many people! Whoever you are, thank you!